Are the horrors of the Great Tribulation in the past– or still future? I am sharing a short series of articles by Terry Cropper of Philadelphia. Terry has done a fine job of investigating and sharing some powerful points about the Great Tribulation, Past or Future? Be sure to read the previous article here. Paul also gave numerous warnings against the prophets and their false doctrine. Paul warned the Ephesian elders in Acts 20:28-30 Therefore take heed to yourselves and to all the flock, among which the Holy Spirit has made you overseers, to shepherd the church of God which He purchased with His own blood. For I know this, that after my departure savage wolves will come in among you, not sparing the flock. Also from among yourselves men will rise up, speaking perverse things, to draw away the disciples after themselves. The Greek word for lawless is ἀνομίαν and thus means (without law or lawless practice lawlessness, work iniquity). In the New Testament (King James Version) this word is translated in different ways (“lawless,” “unlawful,” “wicked,” “transgressor”) but it always conveys the basic meaning of lawless. The Greek word (ἀνομίαν) is also translated in various ways (“unrighteousness,” “iniquity,” “transgression of the law”) but each time it carries the basic meaning of lawlessness. Paul’s missionary journeys are completed as he writes from his imprisonment in Rome to the saints in Colsse the year is 64 A.D.…if indeed you continue in the faith, grounded and steadfast, and are not moved away from the hope of the gospel which you heard, which was preached to every creature under heaven, of which I, Paul, became a minister. (Colossians. 1:23). Jesus told the disciples to preach the gospel throughout the world. Paul freely admitted he had preached “to every creature under heaven.” Paul writer in the Epistle to the Romans “First, I thank my God through Jesus Christ for you all, that your faith is spoken of throughout the whole world.” (Romans 1:8). Indeed, the Gospel had been preached to what THEY considered to be the whole world. And “the end” that THEY were anticipating was the end of the Old Covenant world that was centered around the Temple that was destroyed in A.D. 70. At the time of ancient Israel they did not think in terms of the globe as we do today. So they wrote in terms with which they were familiar. When we use the word world, we use it in a globe sense the whole planet, but to Jesus, Paul and others in the first century people it meant something much less. To those living in first-century it was not the globe but the Roman Empire. For example a decree from Caesar Augustus, went out that all the world should be taxed. Luke 2:1, KJV And it came to pass in those days, that there went out a decree from Caesar Augustus, that all the world should be taxed. Augustus didn’t rule the globe, he ruled the Roman Empire. At that time Augustus, made a decreed that throughout the Roman Empire they should be taxed. Another good example is when Paul and Silas were accused of turned the world upside down when they preached in Thessalonica. Act 17:6: “But when they did not find them, they dragged Jason and some brethren to the rulers of the city, crying out, “These who have turned the world upside down have come here too.” They did not turn the globe upside down it was the Roman Empire. Paul was accused again before Felix: “…we have found this man a plague, one who stirs up riots among all the Jews throughout the world” (Acts 24:5). Of course this was not the globe. There did not have cell phones or social-networking like Facebook all they had was horses at best. And there is more evidence. “And there stood up one of them named Agabus, and signified by the Spirit that there should be great (dearth throughout all the world: which came to pass in the days of Claudius Caesar).” (Acts 11:28, KJV). This was fulfilled during the reign of Claudius. Matthew 24:15-16 “Therefore when you see the “’abomination of desolation,’ spoken of by Daniel the prophet, standing in the holy place …, then let those who are in Judea flee to the mountains.” This is one of most detailed prophecy of the end time. “Luke’s parallel statement to show that the abomination spoken of by Daniel would take place when Jerusalem is surrounded by armies. “ “But when you see Jerusalem surrounded by armies, then know that its desolation is near. Luke 21:20 (NKJV) What brings desolation to a city? The army of an enemy. Luke 21:24 And they will fall by the edge of the sword, and be led away captive into all nations. And Jerusalem will be trampled by Gentiles until the times of the Gentiles are fulfilled. Notice Luke said they will fall by the edge of the sword. Such weapons of warfare would not be appropriate for today’s warfare. So, what then was “the abomination that would bring desolation to Jerusalem?” When the temple area was taken by the Romans, and the sanctuary itself was still burning, the soldiers brought their legionary standards into the sacred precincts, set them up opposite the eastern gate, and offered sacrifice to them there, acclaiming Titus as imperator (victorious commander). 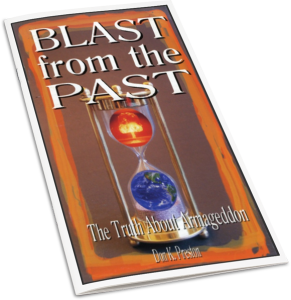 For more on the Abomination of Desolation and the Great Tribulation, see Don K. Preston’s book, Blast From the Past, the Truth About Armageddon. 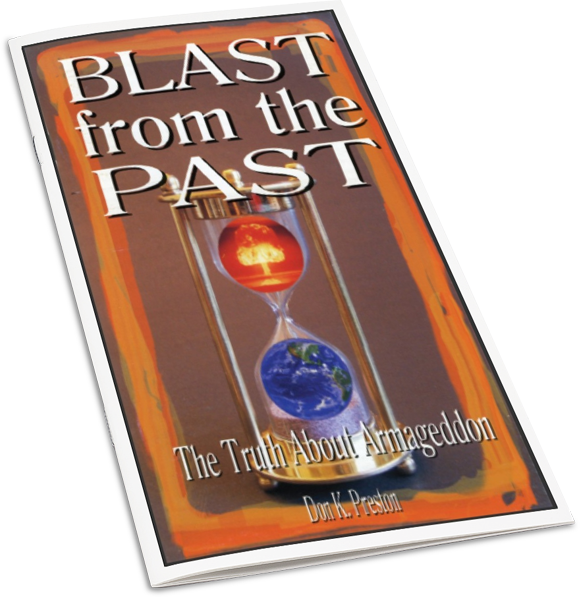 This book contains stunning and powerful proof that the Great Tribulation is in the past! A must read! The Roman army is called an abomination, for its ensigns and images, which were so to the Jews. Josephus says, (War, b. vi. chap. 6,) the Romans brought their ensigns into the temple, and placed them over against the eastern gate, and sacrificed to them there. The Roman army also made desolate, and lay waste Jerusalem. So the abomination of desolation is not the Dome of the Rock in Jerusalem today. It was the destruction of Herod’s Temple in the Jewish War of A.D.70. All this happened during Jesus contemporary generation. All of this definitively answers the question: The Great Tribulation, Past of future?